One of the new features in this update is reports. We’ve added a new reports page where you can get a more in depth view in the performance of your downloads. 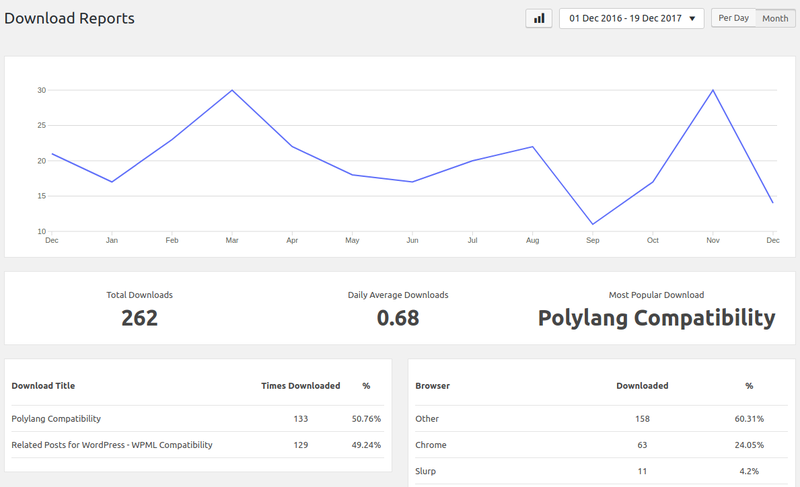 You can select any date range you like and get an overview of your download statistics of that period. The report page will show the basic data like how many file downloads were done in given period but will also display what browers your users are using to download these files. The chart on the page can be displayed as a line chart or a bar chart. Until this update, your downloads were hidden from your WordPress search results. In this update we’ve added the option let them be included. Because by default your downloads do not have a details page, the search results link directly to your download URL (starting a download request). All of our extensions will work with downloads that are linked from search results. This feature will be disabled by default and can be turned on in your Download Monitor settings page. This update also contains a lot of tweaks and rewrites. I’ve rewritten most of the code to make it more stable, testable and extendable. These aren’t things an average user will notice directly but they do make it possible to create a whole new range of features. If you’re a developer and want to learn more about how to create code for Download Monitor, a good place to start is the Download Repository documentation page. If you’re a user of one of our Download Monitor Extensions and you’ve updated to Download Monitor 4.0, you need to update your extensions as well. We’ve released an update for every extension we offer and they all have the version 4.0.0. If your WordPress admin does not offer you an update, you can download the latest files from your My Account page. If you’ve overridden and modified any template files, there is a chance you need to update them for Download Monitor 4.0. We’ve created a documentation page that will help you do this. You can read more about this here. There are a lot more features and tweaks that I didn’t highlight in this post. If you want a full overview of everything that has changed in this update, you can find the changelog here. I’m super excited about this update not only for what it offers today but also because it will be a solid foundation of many new features in future updates. I’d love to hear what you think. Please let me know via the comments below or send us an email via our contact page. The Reports is very good. I do agree that this would be a great addition to the core plugin so I’ll look into a way to add this in a feature update! Thanks for your diligent work. Next to my membership plugin, Download Monitor is my most crucial WP plugin for my business. Thanks for your kind words and for using Download Monitor! is there any way to hook into the reports module to add functionality? Have you removed download analytics in the new update ? April download records are not showing.